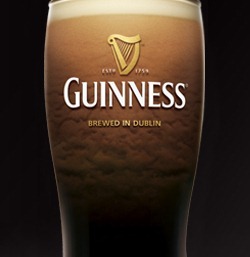 Guinness – a better beer to drink? If you are on a weight loss or maintenance plan you really should be reducing alcohol intake as much as possible, but we all benefit from letting our hair down once in a while and having a cold smooth drink. In honor of yesterday ( St Patrick’s day,) and today’s national hangover day, I wanted to point out that if you were to choose a non-light beer then Guinness is a good choice. A pint of Guinness contains 17 grams of carbs, almost 2 grams of protein and 195 calories and its heavier consistency makes it less likely for most to drink more or as quickly. Sam Adams, as a comparative example, contains 24 grams of carbs and around 210 calories. In addition, its pretty hard to tint a Guinness green, another huge bonus in my eyes.